To soak or not to soak? That is the question? I have been an avid griller and smoker for over twelve years now. In fact, when we started the grilling woods business here in Maine, I felt that it might be prudent if I actually learned how to use the product that we were selling! I have been a student ever since. While I am still learning and trying new recipes and techniques every day, sometimes it is necessary to go back to the basics to question some of the things that I have taken for granted. 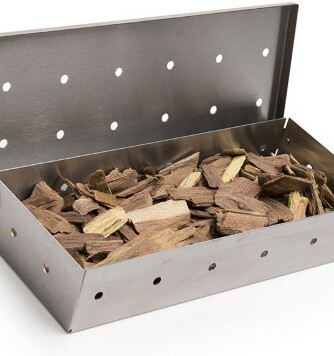 I use all of our twelve varieties of grilling wood chips depending upon the smoke flavor that I want for a particular entree. I have smoker boxes for my propane grill. I use chips in my electric smoker and I throw on chips in my charcoal grill for flavor. But, for chips that you want to burn (smoke) for flavor, what is the purpose of having steam rather than smoke for the first ten minutes of your grilling event? In fact, one of two things happened to me when I soaked my chips: 1) the grilling event was almost over by the time I had flavorful smoke, or 2) I had to wait ten minutes for the chips to start smoking before I could begin grilling! By this time, you probably have guessed MY answer to the question. As for you, only you can answer the question!